Cranberry Capsules - 700 mg, 60 Veg capsules each (Nature's Wonderland) - Penn Herb Co. Ltd.
Recurring urinary tract imbalance affects tens of millions, especially women. 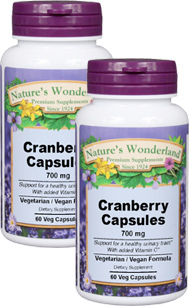 Get the powerful, proven protection of Nature's Wonderland Cranberry capsules and flush your urinary system clean. It's the safe, time-proven preventative approach. Cranberry's natural compounds inhibit foreign particles from binding to the surface of the bladder walls and the urinary tract, thereby allowing them to be easily flushed out. Reach for nature's solution - the amazing Cranberry! As a dietary supplement, take 2 capsules 1 to 2 times daily, preferably with meals. For added cleansing action, combine with Nature's Wonderland Uva Ursi capsules (Item # 427x).